Look at me - I'm making granola! And I'm loving it so much I may never buy granola again. Preheat oven to 300. Mix together dry ingredients, except the 2-3 tablespoons flax. Mix together the water and ground flax and let sit for a few minutes. Mix together all other wet ingredients, then add in the flax & water mixture. Combine wet and dry. Combine it really well until everything is moist and sticking together in clumps. 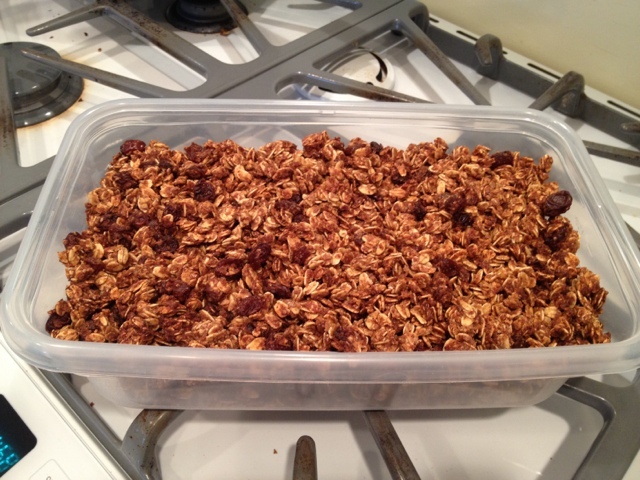 I like some big oaty crunchy clusters in mine, so add a little more water if you need to, to get it to stick together. Spread it out on a cookie sheet and put in the oven for about 40 minutes, but set your timer for 10 minutes increments and stir and turn it every 10 minutes - the goal is to get it all nice and brown. It will still be a little soft when it comes out, but it will get cruncy as it cools. Mini Pigs in a Blanket!